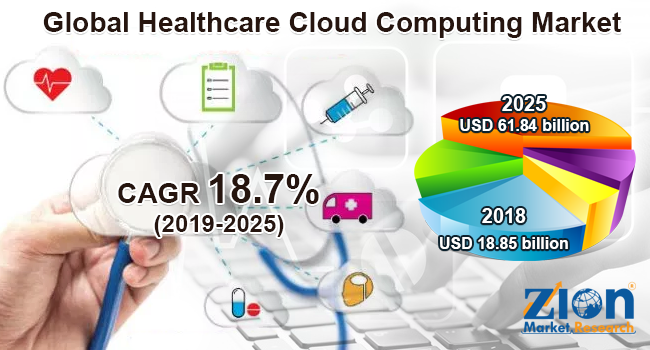 Global healthcare cloud computing market expected to generate around USD 61.84 billion by 2025, at a CAGR of around 18.7% between 2019 and 2025. Cloud computing is a technique for supplying information technology (IT) facilities that help in regaining assets from the internet by using web-based applications and tools. The report covers a forecast and an analysis of the healthcare cloud computing market on a global and regional level. The study provides historical data from 2016 to 2018 along with a forecast from 2019 to 2025 based on revenue (USD Billion). The study includes drivers and restraints for the healthcare cloud computing market along with the impact they have on the demand over the forecast period. Additionally, the report includes the study of opportunities available in the healthcare cloud computing market on a global as well as regional level. In order to give the users of this report a comprehensive view of the healthcare cloud computing market, we have included a competitive landscape and an analysis of Porter’s Five Forces model for the market. The study encompasses a market attractiveness analysis, wherein all the segments are benchmarked based on their market size, growth rate, and general attractiveness. The report provides company market share analysis to give a broader overview of the key players in the healthcare cloud computing market. In addition, the report also covers key strategic developments of the market including acquisitions & mergers, new product launch, agreements, partnerships, collaborations & joint ventures, research & development, regional expansion of major participants involved in the healthcare cloud computing market on a global and regional basis. The study provides a decisive view of the healthcare cloud computing market by segmenting the market based on application, component, service model, deployment model, and end-user, and region. By application, the healthcare cloud computing market includes clinical information system and nonclinical information system. The clinical information system is sub-segmented into image sharing solutions, VNA, and PACS, EMR, PHM, LIMS, Telehealth, RIS, PIS, and others. The nonclinical information system is further sub-segmented into billing and accounts management, RCM, financial management, supply chain management, HIE, fraud management, and others. The component segment includes software and services. The service model segment includes IaaS, PaaS, and SaaS. The deployment model segment includes public cloud, hybrid cloud, and private cloud. The end-user segment includes healthcare providers and healthcare payers. The report also includes detailed profiles of various end players, such as Cisco System Inc., Allscripts Healthcare Solution Inc., Dell Inc., Athenahealth Inc., EMC Corp., IBM Corp., GNAX Health, Microsoft Corp., Iron Mountain Inc., VMware Inc., Qualcomm Inc., and Oracle Corp., among others.